White Saikyo miso ozoni is a Japanese soup that originates from the Kyoto region of Japan. It is unique in that the base of the ozoni mochi (rice cake) soup is made from a sweet pale white miso (fermented soybean paste). 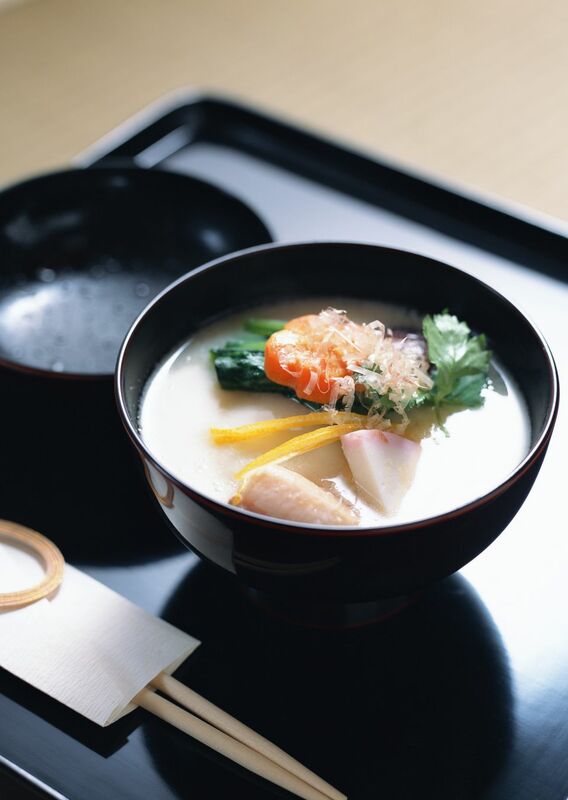 Aside from the mochi (rice cake) and white miso, other ingredients might include a variety of vegetables, commonly with carrots and daikon radish, but largely dependent upon the region of Japan, individual family tradition, and preference. Other ozoni soup add-ins might include taro root (sato imo), mizuna vegetable, mustard greens, spinach, various fish cakes, sweet potatoes, chicken, seafood. The key to Kyoto style ozoni is white Saikyo miso which originates from Kyoto. The miso is a very pale white color in comparison to traditional miso which tends to range from yellow to dark brown and red. Saikyo white miso tends to have a lower sodium content because of the way that it is made, and as such, has a much sweeter flavor. Choose which method you will use to prepare the dashi. For dashi from scratch, follow the recipe on our blog here. If you are making quick dashi, add water in a stock pot and soak the konbu dashi (dried kelp) for 4 to 8 hours. If you do not have time to do this, soak the konbu for 30 minutes to 1 hour. Leave the dashi konbu in the stock pot while the soup cooks. Slice carrots into delicate rounds, and slice daikon into thin rounds, then cut the rounds into halves or quarters, depending on the width of the daikon. If you are using fresh taro root or sato imo, peel the rough skin, then slice into rounds. Sato imo is also available for sale pre-peeled and cut into small balls in the freezer section of some Japanese grocery stores. Feel free to substitute fresh taro with frozen taro. Over medium high heat add dashi, and carrots, daikon, and sato imo (taro root) and bring to a boil. Skim any impurities from the surface of the stock. Over medium-low heat, cook vegetables until they reach desired tenderness. Remove a piece of konbu from the pot and add mizuna leaves. Lastly, add mochi to the pot and cook an additional 2 minutes until tender. Alternatively, make grilled mochi (rice cake), serve soup in small bowls, and garnish soup with a beautiful piece of grilled mochi. Enjoy immediately. Ozoni is fundamentally a soup with mochi (rice cake), and for this Saikyo miso ozoni recipe, the rice cake may either be boiled with the soup, or it may be grilled. Two options for preparing the dashi broth are provided. Only 4 cups of dashi are required for the recipe, so please choose only one method for preparing dashi from scratch or the recipe for the quick dashi. Please do not accidentally double the recipe and use 8 cups of dashi.